It has been a long-cherished vision of ours to create our dream garden with a section being a productive, yet equally beautiful, garden. 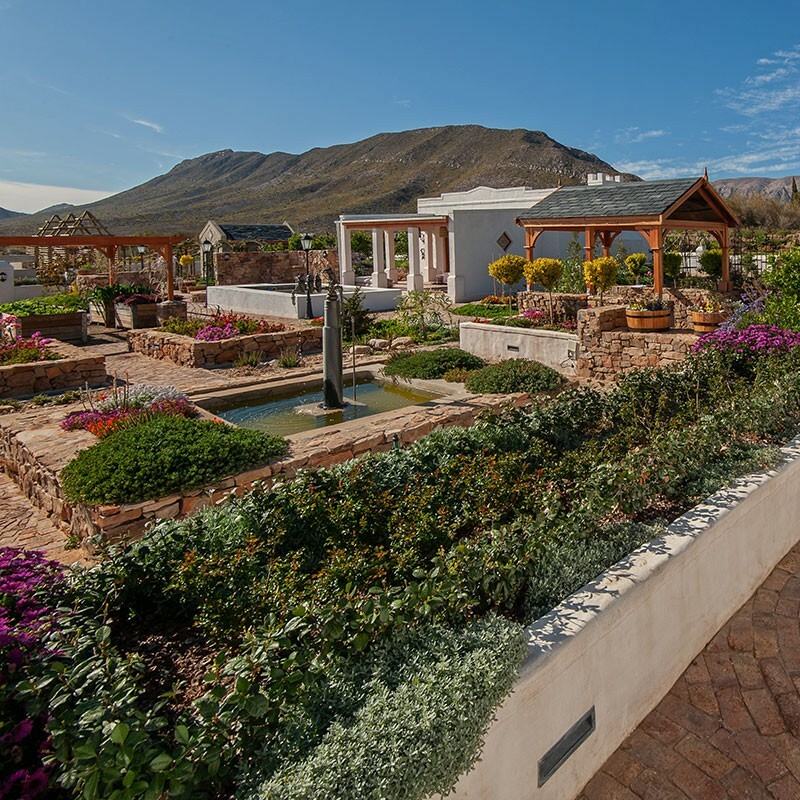 This was achieved through joining forces with landscaper Rentia Verster, and with input from our builders, Adan Liepner and Neels Swart of Agri-Eco-Earth cc. Hard work, passion and the sharing of ideas made our dream a reality. The Garden had to evoke a feeling of abundance, with beautiful colours, textures and aromas to satisfy the senses. It also had to be accessible to all ages with practical raised beds and paved areas for us to work and utilise the space well into our old age. 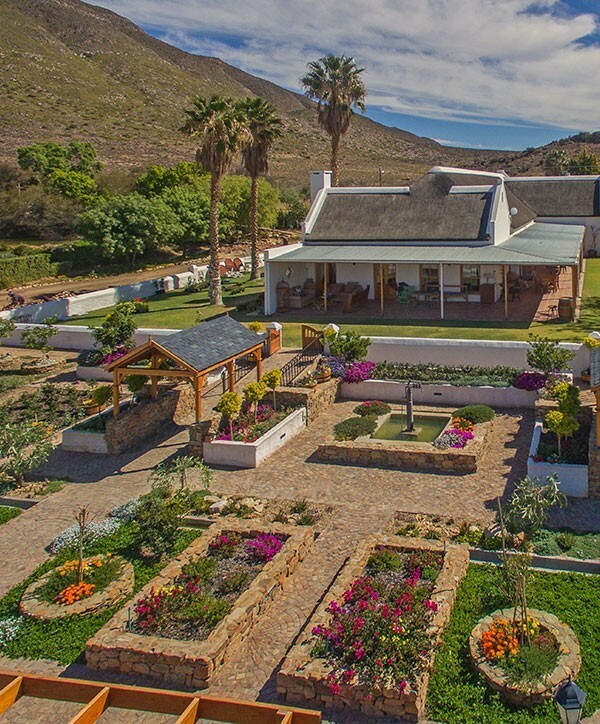 Although the garden can hardly be described as minimalistic certain areas were designed to reflect the arid and open spaces of the Karoo. The town of Prince Albert has been influenced by many cultures with travellers and foreigners succumbing to its beauty and settling here. The garden’s style reflects this multi-culturalism, and in the different ‘garden rooms’ many formal and informal influences are visible from French, Colonial and European type gardens. A creative edge is added to the garden by a small greenhouse and a quirky chicken den. The plants were carefully selected to handle the summer heat and the winter cold. Wind breaks were planted to shelter the garden from the wind from the mountain. To ensure lush flower beds, an extravagant amount of organic compost and fertiliser was added. 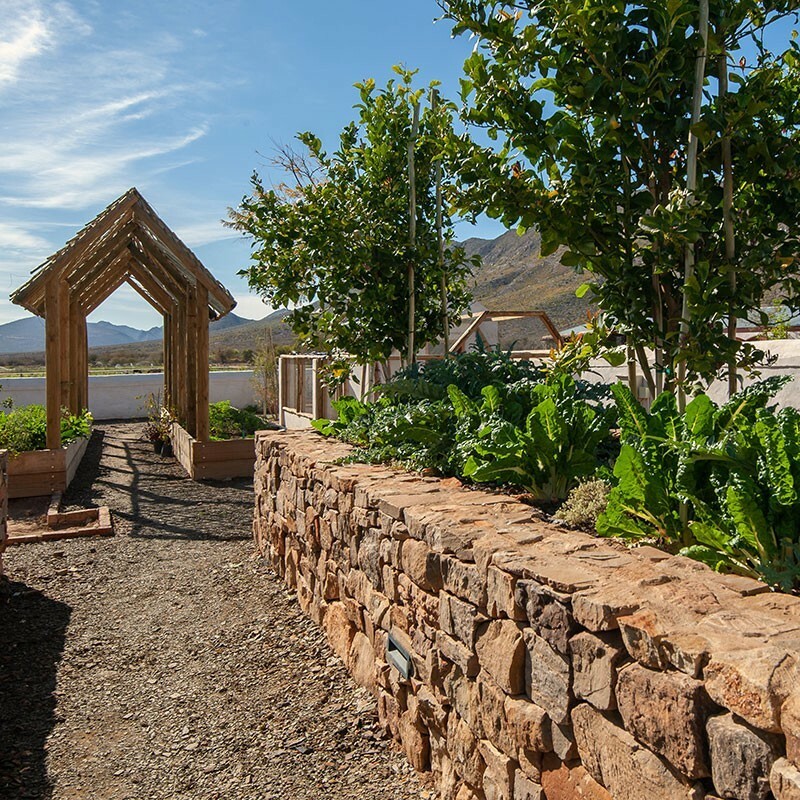 In the arid Karoo, mulch is non-negotiable, and layers of peach pips ensure that the roots are kept cool and protected from the sun, while saving water. Plants with similar water needs were also grouped together to save water. 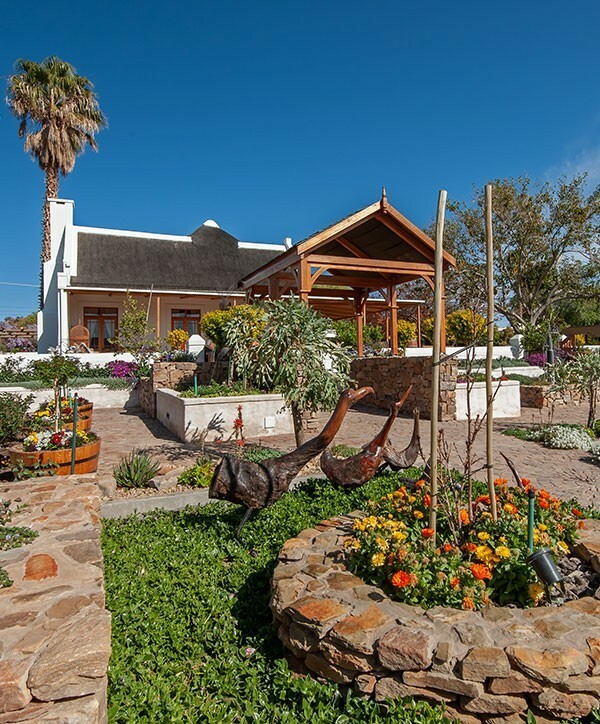 The garden design was done in layers, close to the farmhouse to form a foreground to the magnificent mountains, with the glorious sunsets as a backdrop. The more ornamental and structured planting areas are near the house, with the garden gradually dispersing into areas for vegetables and herbs, and then then flowing over to the edges into fruit orchards, which creating a gradual link to the fields planted with animal feed. Three-dimensional layers form the backbone of the design. Different shapes and heights of raised beds (built from local rocks) and paths of different textures, meandering through the garden, link the different spaces in a cohesive and visually pleasing landscape. We love nature, and it was an important consideration in the design of the garden. A natural pond is home to fish, sheltered by aquatic plants, and a choir of croaking frogs. Birds are attracted to the water, while butterflies enjoy the flowering perennials bordering the pond. 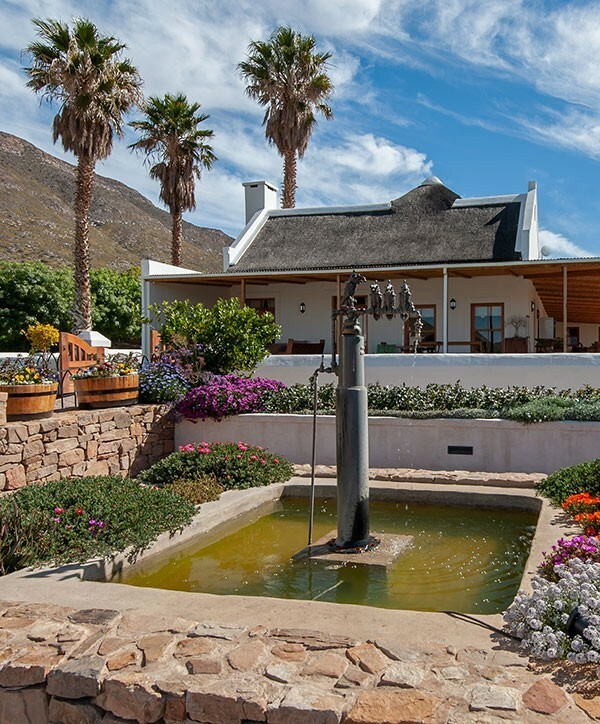 Water forms an essential part of the design, with a Karoo style swimming pool providing welcome relief from the hot Karoo sun. The pool is near the centre of the garden, which was designed as a gathering space with a pool room and indoor braai, as well as an outdoor boma to watch the stars at night next to a crackling fire. A more formal water feature, in the form of a square rock pond typical of the square dams built around Prince Albert, features a magnificent bronze artwork by sculptor Jacques Fuller. A larger dam on the outskirts of the grounds are linked to the garden through a meandering small pebble furrow stream, which constantly flows down to a dam, with a windmill near the bottom of the garden. The sound of trickling water creates a relaxed and cool feel and much-needed shade is provided by pergolas, with vines, roses and flowering creepers like wisterias and golden showers providing shade over seating areas and pathways. 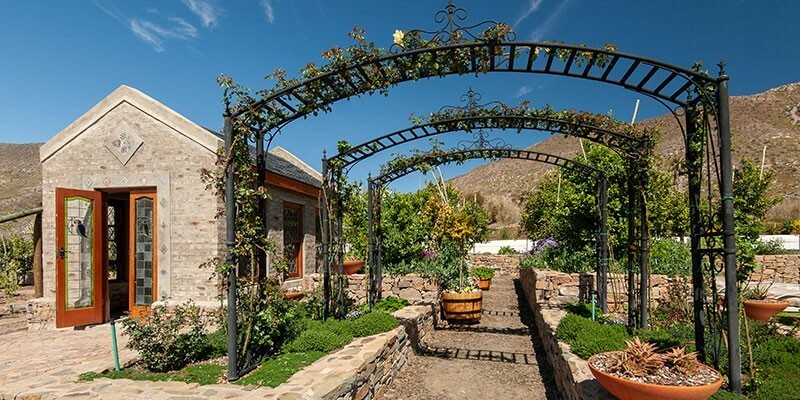 Different pergola structures were erected over the vegetable beds to allow enough sun and light through, while protecting the plants from the scorching sun. Fruit and ornamental trees provide shade during the hot summer days. The brim of the larger dam was planted with indigenous flowering perennials, shrubs, succulents and vygies, and seating areas allowing guests to enjoy the stunning views at sunrise and sunset. 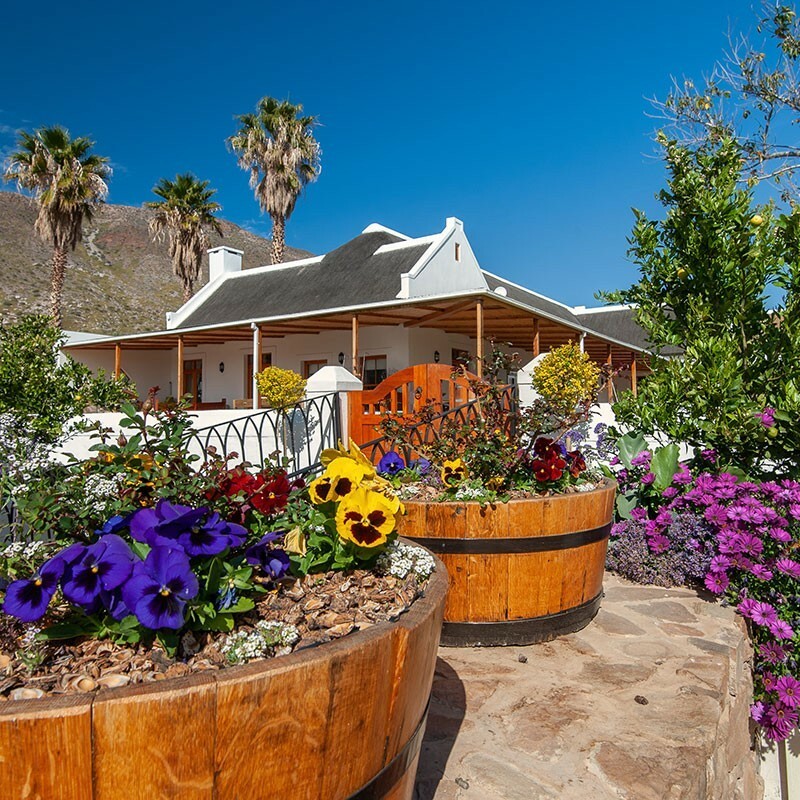 A beautiful rose garden was planted in honour of the poet and writer, C J Langenhoven, who courted the daughter of the owners of Mirtehof more than a century ago. He lost his heart to the young woman, but eventually lost her hand to an other suitor. Legend would have it that she could not decide between the two men, and decided to send both of them a letter. Whomever received their letter first would then be her husband. The hapless Langenhoven was let down by the Postal Services! Despite this sad love story, we would love to share the beauty and produce of our garden with guests at Mirtehof. If you feel the need to plant a seed or pluck a weed, you’ re most welcome!